Product #45729 | SKU DRDP3LBEK | 0.0 (no ratings yet) Thanks for your rating! 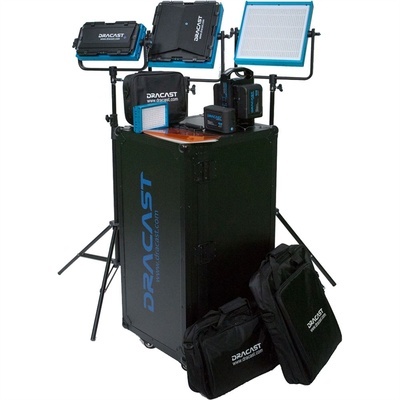 Be ready for nearly anything with this bi-colour ENG Plus 4-Light Kit from Dracast . It packs together two LED1000 Plus LED lights and an LED500 Plus LED light, which when combined make a great three-point lighting setup, along with a small LED200 on-camera LED light for more mobile setups. Besides the fixtures, the kit also includes three 90Wh V-mount lithium-ion batteries and a dual battery charger, as well as four-way barndoors, filter frames, and two filter sets for the LED1000 and LED500 panels. Additionally, three light stands and a hard carrying case are included. Expanding on their line of panels, the LED1000 Plus Series Bi-Colour LED Light from Dracast adds a digital display for adjusting output as well as Cat5 DMX input and output for linking and comes with both Gold mount and V-mount battery plates. The light features 1024 LEDs with a high CRI of >95 for excellent colour accuracy. Also, this model features a variable colour temperature from 3,200-5,600K for quickly matching either daylight or tungsten sources without needing to mess around with gels. The lights offer a spot beam angle of 45° as well as dimming from 0-100%. Benefitting operation, it can run off of either a DC source, such as a Gold mount or V-mount battery, or a universal 100-240 VAC adapter. The light is durable as well with an aluminium chassis, frame, and mounting yoke and it only consumes 60W of power. Additionally, it is lightweight at just 5.5 lb and measures 12 x 12 x 2" in size. Expanding on their line of panels, the LED500 Plus Series Bi-Colour LED Light from Dracast adds a digital display for adjusting output as well as Cat5 DMX input and output for linking and comes with both Gold mount and V-mount battery plates. The light features 512 LEDs with a high CRI of >95 for excellent colour accuracy. Also, this model features a variable colour temperature from 3,200-5,600K for quickly matching either daylight or tungsten sources without needing to mess around with gels. The LED200 Bi-Colour On-Camera LED Light from Dracast is a 3200 to 5600K on-camera LED designed for DV and DSLR photographers in need of a lightweight, portable, and continuous lighting source. The LED fixture mounts onto a shoe mount. It has a life expectancy of 50,000 hours, a CRI of over 95, a run-time of two to four hours, and an effective distance of 20'. The light comes with a nylon soft carry case. These Barndoors from Dracast are made for the LED1000, and slide into a slot on the front of the LED light. They are used to control the spread of the light and prevent unwanted light spill and they feature a filter holder. The Dracast Filter Frame for LED1000 allows the use of Dracast or other brand diffusion, CTO, CTB or effects filters with the fixture. Constructed of lightweight aluminium, the frame drops into the fixture's accessory channel. It has a frame lock to prevent filter slippage. The Dracast 2 Filter Set for LED1000 Panel contains 2 rigid light modifiers that measure approximately 12 x 12" to match the fixture. Included in the kit is one 1/2 CTO filter to warm the light's daylight balance towards the tungsten end of the spectrum. A Half White Diffusion is also included to soften the light's output. The Dracast 2 Filter Set for LED500 Panel contains 2 rigid light modifiers that measure approximately 12 x 6" to match the fixture. Included in the kit is one 1/2 CTO filter to warm the light's daylight balance towards the tungsten end of the spectrum. A Half White Diffusion is also included to soften the light's output. The DLS-805 Spring-Cushioned Light Stand from Dracast extends from 28.5" to 72" and has a load capacity of 13 lb. It folds down to 28.5" for transport, and weighs 3.4 lb. There is a 5/8" stud on top of the stand.